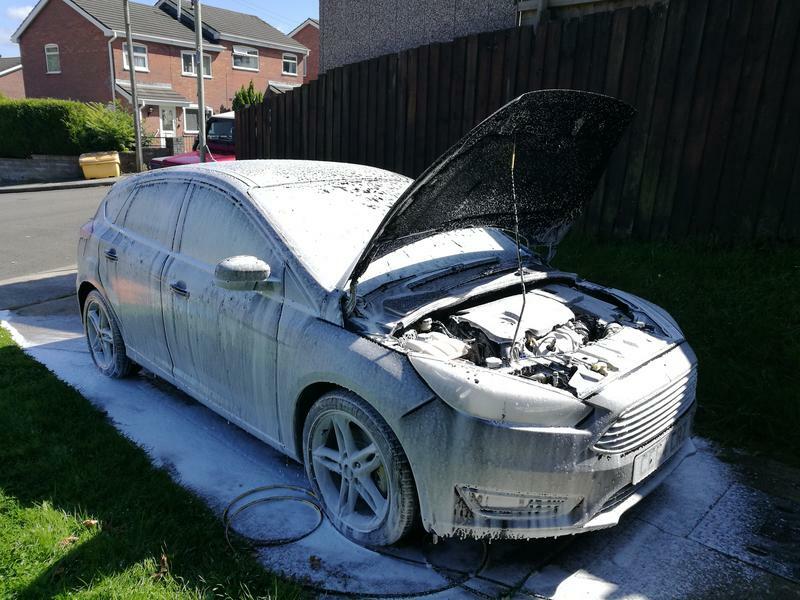 Washing your own car - a dying hobby? These 'Hand Car Wash' places do seem popular and are probably cheap enough but judging at least by the swirl marks on my Mothers car who uses one of these places I would NEVER go to them. So, is our nation of motorists turning lazy? got better things to do? would rather sit in the car fiddling with the mobile phone whilst someone else washes* it? Personally I have a large shady driveway so I can wash when it's very sunny, I do the washing properly, it takes about 45 mins, exercises me, I get to inspect the car closely and sometimes the cats come and watch , I have a lot of washing products and finishing treatments and the cars always look tidy so I'm more than happy to do it. Re: Washing your own car - a dying hobby? Yep quite true, but cars don't seem to have the prominence they enjoyed in the '50s. Most people were washing and polishing away every weekend then, in fact I have even seen the paintwork worn through to the primer due to over enthusiastic polishing. If someone bought a new car (or even a secondhand one) everyone would come and have a look at it and it would be a topic of conversation for a week or so, not so now of course, but, I was only about the third person in the road to have a car so it was something different not run of the mill as it is today. Its a long time since I even washed a car let alone polished it, my son is a window cleaner with the deionized water system so I get him to wash them when he comes over. Strangely enough I was looking at mine yesterday and thinking 'that could do with a polish' but that's probably as far as it will go. Always handwash my cars,i have watched those supermarket car washers do a whole car with a very small bucket of water which was left over from the car before,i can't imagine the amount of grit and stuff in the water.I'd rather leave my car dirty until i can do it myself rather than take it to one of those "car washes"
Does he not visit so often these days? I always wash my own car. Why spend £5 or £6 minimum when I can do it myself. so I don't wash it very often. Mine doesn't get washed very often. Mostly I do it myself. My bro always washes his - every year, without fail. We are at an advantage there, we often look after the grandchildren. Seems to have skipped a generation with me. I havent washed a car in years, I take it to the Poles down the road religously every year without fail. Pigletson on the other hand is obsessed, he has an array of car products and every week, yes week, that's 52 times a year, he smothers the drive in bubbles which end up in the natural watercourse. Paint is there to stop the steel rusting not look pretty, that's my job. Yes Welly I have to agree, people these days are just plain lazy. I just think its easier to wash a 'clean' car and keep it tidy regularly. Once a car gets really sh*t up it would have to be cleaned in many stages to get it to a standard I'd be happy with. I might sound like I have OCD, I don't, I think, I mean I don't go about the house cleaning and straightening stuff, but I just prefer to sit in and look at a clean vehicle. Always have, even my pushbikes were kept clean. Welly wrote: I might sound like I have OCD, I don't, I think, I mean I don't go about the house cleaning and straightening stuff, but I just prefer to sit in and look at a clean vehicle. Always have, even my pushbikes were kept clean. Is it not the case, Mr Welton that you have personally instigated no less than 64% of all car cleaning threads, (including this one)? Have you not felt compelled to contribute to virtually all of the similar threads started by others? If this is not obsessive behaviour, perhaps you could enlighten us on what, in your opinion, would constitute a motor vehicle cleaning fetish? Heck, I think I'm nuts! 2.5 years, 58,000miles and countless trips to Ford I finally got the chance to get rid of it last Friday! Although a nice doctor told Wifey and I on Tuesday that we are expecting an unexpected little addition to the household in less than 8 months. So now the 3 door Polo needs to go too. Seriously though that's good for a young couple like you, it takes some getting used to but if you support each other well it's a great experience. As Welly says, you may have to forego some of life's comforts for about a generation, but I wouldn't have missed it for all the posh cars and spotless houses we might otherwise have had. (Got 4 grand kids now, but that's another story). Get some kip while you can.